Many writers have tried to capture the bewildering beauty of Kerala only to discover that such serene landscapes damage their faith in the adaptability of language. 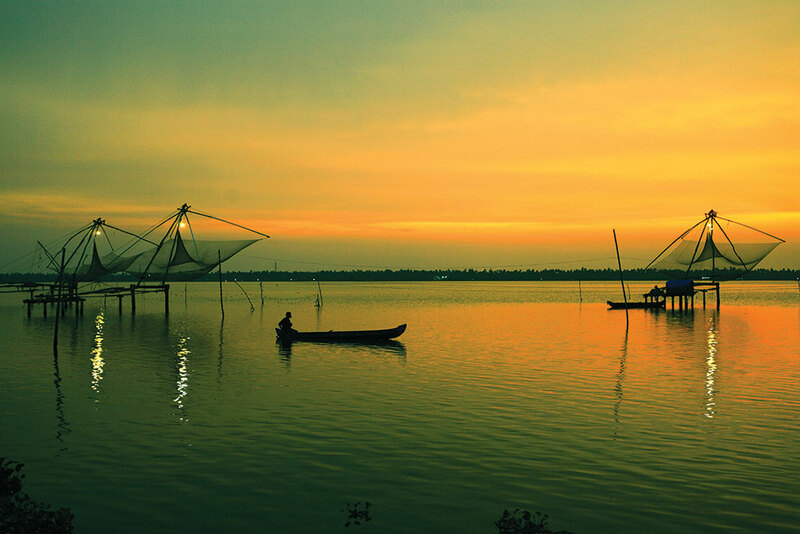 This small state at the south-east tip of the Indian sub-continent is endowed with a kaleidoscope of beguiling backwaters, placid lagoons and more than 40 rivers sandwiched between an ancient, dreamy past and a colourful, vibrant present. 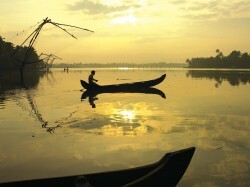 Often referred to as ‘God’s Own Country’, Kerala was voted as one of the 50 ‘must see’ destinations of a lifetime by National Geographic Traveller. Less than a week after The Prince of Wales and Duchess of Cornwall spent a night in a deluxe resort overlooking Vembanad Lake last November, I embarked the motor vessel Oberoi Vrinda a short distance away. This five-star hotel that masquerades as a riverboat was built in 2003 at the Praga Marine shipyard in Cochin. This eclectic vessel accommodates just 16 privileged passengers in eight delightfully furnished rooms, each boasting a private bathroom with shower. I was welcomed aboard by chef-in-charge Diwaker Balodi and introduced to Captain P.M. George Kutta, who has been in command for the last seven years. It soon became evident the crew of 25 would be attending to my every whim during my three-night stay on this archetypal transport of delight. Shortly after sunrise on the first morning we set sail from the purpose-built base at Kayipuram Jetty. Gliding past a tableau of filigree Chinese fishing nets cantilevered over the placid lake, I spotted Brahminy Kites swooping overhead and Blue-Tailed Bee-Eaters perched on stumps of mangrove trees. The palm-fringed shoreline gave way to a patchwork of lush green paddy fields that made the backdrop even more awe-inspiring. A little over an hour later, we began our approach to the labyrinth of meandering waterways, canals, streams and lagoons that make up the 400-mile stretch of the famous ‘backwaters’. As the largest, not to mention most luxurious, vessel to navigate into these sequestered channels known locally as kayals, we edged past an armada of kettuvallams, smaller, traditional houseboats fabricated from teak or anjili wood. 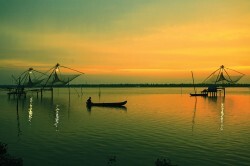 The ‘backwaters’ not only impart intrinsic beauty, they play a vital role in the transport of spices and rice, as well as being a source of livelihood for fishermen. 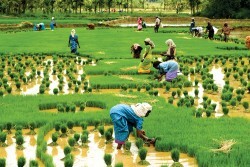 In this unique ecosystem, Keralans have developed a parochial approach to agrarian culture, and I saw villagers harvesting bananas and cashew nuts while smaller farmsteads were engaged in the arduous task of rice-thrashing beside the riverbanks. As our knowledgeable guide pointed out with a sense of pride, Kerala is the only place in the world, apart from the Netherlands, where cultivation takes place below sea level. At Chambakulam, we visited St Mary’s Church, established by St Thomas in 1721. At this site, one of the most ancient and holy places in India, worship was conducted in Aramaic until the 1st century. Later, we saw a traditional snake-boat, which is raced by 120 oarsmen, and then we headed back to the Vrinda for lunch. With the captivating diorama unfolding around the open-air lounge, I joined Roger and Sheila, a retired professional couple from London. 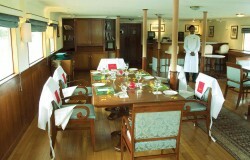 In the air-conditioned comfort of the dining salon, the three attentive stewards served a copious Sadya – a banquet in Malyalam, the language of Kerala. This colourful collation, based on an ayurvedic combination of healthy ingredients and spices such as cardamom, cloves, ginger, garlic, cumin, coriander and turmeric, is served on a banana leaf. We savoured a cornucopia of tasty treats such as coconut and lentil avail, dry vegetable thoran curry, fiery red chilli pachadi and red Pokkari rice. From our vantage point, we watched as traders hawked their wares from door to door in small boats while fishermen sold their glistening catch to locals who crossed the canals in rusty boats. Our passage was temporarily slowed as we gave way to a floating carpet of ducks that were being corralled by their keeper. After glimpsing a few colourful churches and temples, we reached Vembanad Lake. I retreated to the upper deck – where eight sunbeds offered a perfect repose – as we crossed the sibilant water with mauve pontoons of water-hyacinths bobbing in our wake. I took the opportunity to chat to Captain Kutta and he explained that Oberoi Vrinda had been designed by British marine engineer Joe Nejedly, a world championship sailor and Commodore of the Kerala Yachting Association. My three days on board assumed a serene rhythm. As the sun came up like thunder and the air was rifled by warm breezes, I read the Times of India sipping an espresso before retreating to the cool salon for breakfast of freshly-squeezed juices and perfectly-cooked eggs. One day, the three chefs gave us tips on how to use precious local spices in a cookery demonstration. Diwaker explained Keralan cuisine differs from community to community; Hindus prefer delicious vegetarian dishes, while Muslims and Christians are non-vegetarian and enjoy chicken curries with a pathiri (pancake) and biriyanis, a concoction of rice cooked with meat and masalas. It’s little wonder life on board revolves around local cuisine and I enjoyed delicacies such as the legendary mulligatawny soup, baked pearlspot fish with tangy chilli sauce, varutharacha chicken, as well as the legendary Kerala-style fish curry, meen pollichathu. Drawing on centuries of local culture, there was colourful entertainment before dinner each night. The classical dance distinctive to Kerala known as Mohiniattam was staged on board but I especially enjoyed the performance of the highly ritualised Kathakali dance-drama, which was enacted in the private enclave at Kayipuram Jetty. Literally ‘story play’, Kathakali evolved in the late 16th century with characters played by boys who spend five years in training and with faces made up in yellow, red and green as well as white and black. Accompanied by loud drums with an orchestra of four, the story unfolds through a hypnotic series of scenes from the ancient Hindu epics Ramayana and Mahabharata. 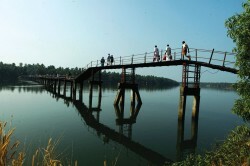 Kerala’s seductive watery enclave, inland from the Travancore coastline, is a heartland of people who exude grace, curiosity and radiant smiles. For most of the year it is tranquillity personified but, when the moisture-laden winds of the south-west monsoon arrive in early June, the land is deluged. For this reason the operating season of Oberoi Vrinda is the beginning of October until the end of April. Most guests enjoying the alluring lifestyle offered during these two and three-night itineraries hail from Britain and the USA and a visit frequently forms an integral part of an in-depth trip to the sub-continent in contrast to the gorgeous complexity and momentum, force of spirit and willpower that pervades other corners of this surreal land. As I discovered during my tantalising sojourn on board, each day became a sublime odyssey that stretched from breakfast to dinner – via nirvana.